On this date in 1618, Venice crushed a Spanish conspiracy with sudden violence. The reality of this conspiracy has been argued for the four hundred years since it was exposed or “exposed” but there is no questioning the security panic experienced by Venice at this moment. Spain’s viceroy to Naples, the Duke of Ossuna, was massing a fleet that the Serene Republic suspected was meant for her; meanwhile, contradictory rumors of possible conspiracies within the city dogged the Doge. The Government now determined to act. On the 12th May 1618 [Nicole] Regnault and the brothers Bouleaux were arrested, just when the former had been writing to his sister in Paris, to say that he had a piece of business in hand which would save him the trouble of earning his livelihood for the future, which was true enough. The two Bouleaux, it appeared at their examination, had been engaged at the Spanish embassy in the manufacture of petards and fireworks in connection with a general plan of incendiarism; and they were forced into the admission that the embassy was a perfect storehouse of arms and ammunition, and that the order of the arrangements had been drawn up by Regnault and Pierre … On the person of Charles Bouleaux were found several damning papers; two letters of Lorenzo Nolot, a Burgundian (Pierre’s messenger to Ossuna), directed to a Signor Pireu, and in his stocking two others written to the Duke of Ossuna … The capture of Regnault and the others produced a scare, and there was a sudden exodus from the city, unhindered by the Executive, and emptying the lodging-houses of their motley and disreputable occupants. All who fell into the hands of the Government confessed that everything on their side was ready, and that if Ossuna had been able to support them, Venice must have been overpowered … On the same day which witnessed the arrests of Regnault and the two Brouleaux, orders were transmitted to the proveditor-general at sea to dispatch [naval officers already detained under suspicion -ed.] Pierre, Langlad, and their secretary Rossetti, in such a manner as he might judge fit; in reporting their executions, Veniero stated that the fireworks fabricated by Langlad for the use of the fleet had been in reality destined to burn it. On the 18th Regnault and his confederates were strangled in prison, and their bodies afterward suspended head downward between the Columns. Other summary measures followed, and about 300 persons paid with their lives for their participation in the foolish and flagitious project; but no particulars have been preserved of the exact number or of the mode of disposing them … What sad shocks must have befallen households where a father, or a son, or a brother, whose guilt was unsuspected perhaps by the rest, was seized by the sbirro to be seen no more! What a spectacle the lower Dungeons must have offered during days and days! This date in 1355 was the morning after the failed coup of Venetian Doge Marino Faliero. And it was the first date that vengeance began to fall upon the plotters. Faliero, voted power by the fellow-noblemen who bossed the Serene Republic, intended to displace the patrician class with commoner support. The scheme called for Faliero’s supporters secretly to mobilize hundreds of men who on April 15 would gather at the Piazza San Marco and mount their surprise takeover. But the plot sank like a stone on the big day, with anticipated adherents turning out sparsely or flatly declining and word soon reaching aristocratic ears of trouble afoot. The would-be masters of Venice were soon rounded up without resistance by the real masters of Venice. In this misfired drama, Faliero’s henchmen — the men upon whom fell the task of orchestrating the cells who would summon the traitor militia — were Filippo Calendario and Bertuccio Isarello. And on this, the following day, they were tried, sentenced, and by evening hung from upper windows of the Ducal Palace. Both men were gagged: one last precaution against the sort of popular exhortation that they had not managed when it counted. “The earth was set in motion,” one chronicler recorded of the Venetian establishment’s reaction to the menace. (Source) Faliero would die the next day; in all, eleven gibbeted corpses festooned the palace as a warning against the next aspirant. Isarello was the captain of a Venetian galley who had been appointed by Faliero — controversially bypassing the usual noble prerogatives — and had rewarded his prince by expertly harrying Genoese merchantmen. Calendario (English Wikipedia entry | the more detailed German), Isarello’s father-in-law, was a stonemason, sculptor and architect who actually worked on the very palace he was hanged from. 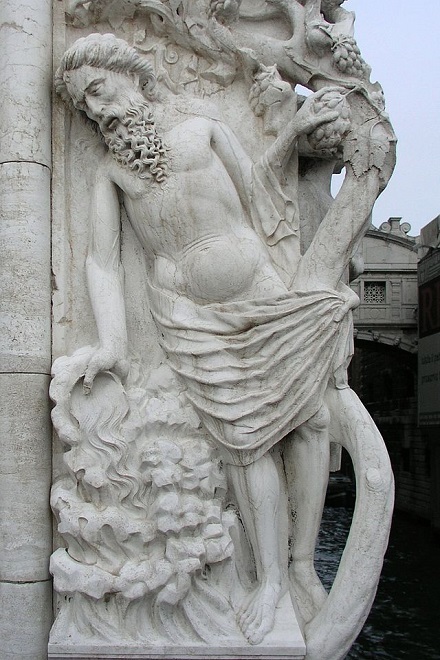 Column capital of Drunken Noah dating from the period of Calendario’s work on the Venetian Ducal Palace. (cc) image from Honza Beran. A Venetian rebel was beheaded on this date in 1310. The resulting power vacuum saw Venice under the Doge Pietro Gradenigo tangle for influence in Ferrara with the Papal States of Pope Clement V.
This controversial intervention briefly put a Venetian puppet ruler in charge of Ferrara, but it also led Clement to excommunicate Gradenigo and place La Serenissima under a papal interdict. Clement also had more temporal weapons to fight with, and he used them to ruthless effect. In August 1309, papal troops overran the Venetian garrison at the Ferrara fortress of Tedaldo and handled the prisoners like they had the Dolcinians, choking the Po with Venetian corpses. Conditions were ripe for some disturbances in La Serenissima. The Ferrara thing was a complete debacle, and not only was the same guy still in charge, but his previous foreign policy resume basically consisted of being repeatedly outmaneuvered by Genoa. 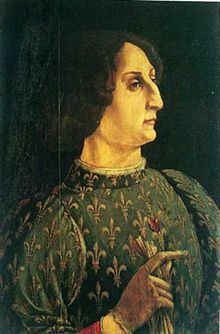 Hotheads of three leading families of the Venetian opposition who had vainly counseled neutrality in the Ferrara affair, the Quirini, the Badoer, and the Tieopolo, embarked an audacious plot to mount a coup d’etat toppling the Doge and the whole Ground Council of noblemen by whom he ruled. The conspirators were to act on the morning of June 15 — but hours before that, a vacillating confederate had betrayed them. As a result, when the ferocious Marco Quirini arrived at the Piazza San Marco that morning with his men-at-arms, the Doge had a surprise force waiting to rout him under a furious downpour. Tiepolo belatedly charged the square, and was like Quirini repulsed; however, he was able to fall back across the Grand Canal, cutting the bridge against his pursuers, and holed up in a makeshift fortress hoping for reinforcements from the last-arriving of their fellows, Badoer Badoer. The latter, however, was intercepted on his way to reinforcing the revolutionaries’ position and taken prisoner, which defeat of his hopes led Tiepolo and Doge alike to prefer a negotiated surrender to the charnel house that would have resulted from storming the redoubt. His followers were amnestied and Tiepolo himself sent into exile. But Badoer Badoer was not covered by this deal. The Council he had proposed to overturn instead tried him for treason, and voted his condemnation on June 22 — a sentence put into immediate effect. And to show these words to everyone forever. That column today has been removed to a museum — evidently one needs special permission to find it — but a worn stone outside a souvenir shop labeled “Loc. Col. Bai. The. MCCCX” marks the spot where it stood for four centuries. 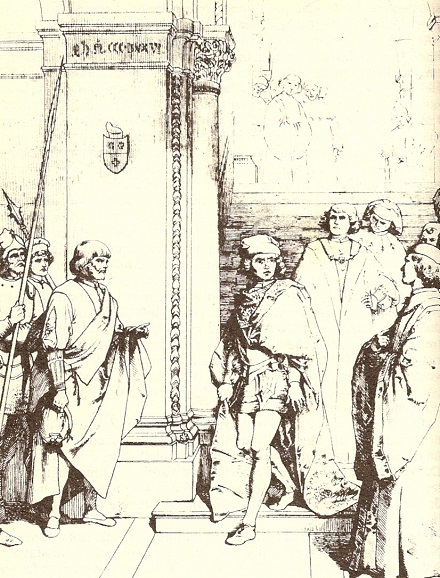 The plot’s other legacy to Venice was the Council of Ten, a sort of inner secretariat of the Grand Council. Introduced in July 1310 as an emergency measure, the Ten soon became a permanent feature of the state, and an increasingly powerful one into the 17th century. The “temporary” council ended up lasting until the Napoleon finally toppled a by-then tottering Venetian Republic in 1797. * In the Inferno, Dante accuses Azzo of assassinating his father. Francesco Baldovino was a gentleman in affluent circumstances, of a handsome person, and of engaging manners. His domestic establishment was princely. He had a large sum in the Funds. In short, every adventitious advantage, which fortune brings, was within his reach, excepting one; Baldovino was not a noble. It is said that, at the period of the War of Chioggia, he desired to become, among the rest, a candidate for the honours of the peerage. But, his paternal ancestor having been implicated in some manner in the Bocconio conspiracy of 1300, the family laboured under a certain obloquy, and Baldovino was a disappointed man. Bartolomeo D’Anselmo was not a bad man; but he was a man of no steady principle, and of an exceedingly nervous temperament. He had hardly bidden farewell to Baldovino, when the treasonable dialogue which had passed between them began to haunt his imagination. He found himself a prey to a variety of unwholesome and chimerical fancies. The echoes of his own words grated on his ears. The sound of his own voice threw him into a cold sweat. He conceived it more than possible that they might have been overheard, and that they were betrayed. He pictured himself arrested, dragged before the Ten and into the chamber of torture, put to the question, condemned to an infamous and horrid punishment. If there had been eavesdroppers, he was pretty sure that this would be his destiny; and he knew that there was only one method of escaping from the danger. He was base enough to pursue that method; D’Anselmo turned evidence, on the same day, against his friend. The informer was pardoned and ennobled. The man, whom with such vile and pitiful cowardice he had denounced, was taken into custody, examined under the cord, and on Saturday morning the 5th, at eight o’clock, was executed between the Red Columns, where he was left hanging three days, as a warning to traitors. 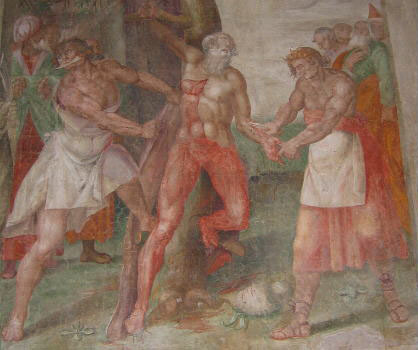 On this date in 1571, the commander of a Venetian garrison was flayed by the Turks. 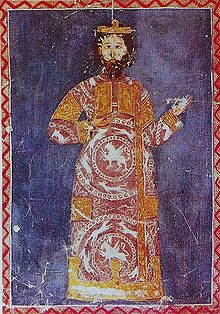 Marco Antonio Bragadin (English Wikipedia entry | Italian) — or Marcantonio Bragadin — was the captain of Famagusta as an Ottoman Empire near the peak of its power began to wrest Cyprus from eight decades of Venetian control. The Turks sacked the wealthy Cypriot capital Nicosia in September 1570, slaughtering or enslaving the inhabitants. Bragadin thereupon received an inducement from the invaders to surrender the last Venetian outpost still remaining in Cyprus: the severed head of Nicosia’s general. Bragadin was having none of it. I have seen your letter. I have also received the head of the lord lieutenant of Nicosia, and I tell you herewith that even if you have so easily taken the city of Nicosia, with your own blood you will have to purchase this city, which with God’s help will give you so much to do that you will always regret having encamped here. The Famagustans didn’t get quite that much help from God, but they forced a dear purchase in blood. For nearly a year, they repelled the siege; starving and exhausted, they at last accepted a merciful surrender only to have the entire garrison slain (the link is in Italian) at the beginning of this month. The entire garrison, save Bragadin. Special torments were reserved for the general who had given them such trouble. 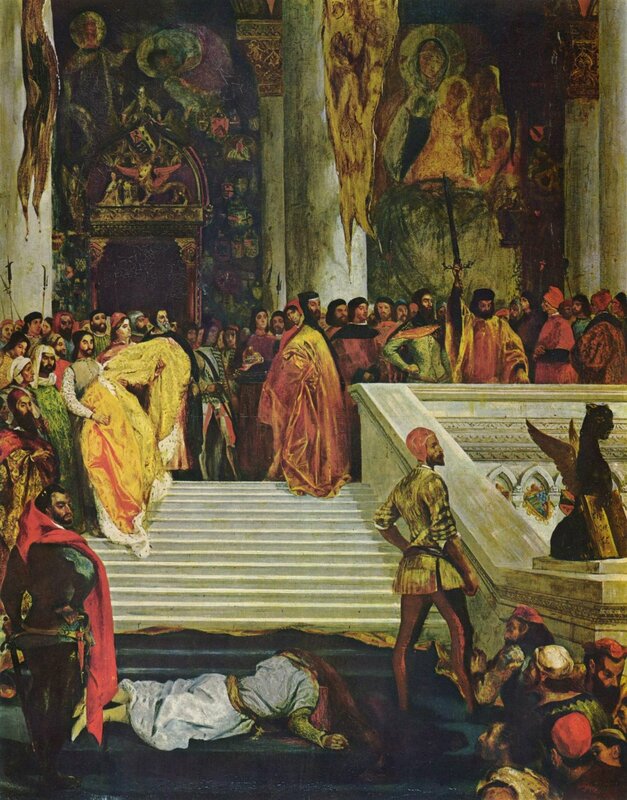 Executed Today friend Melisende’s Historic Biography post on Bragadin recounts the nauseating Calvary of the Venetian: mutilated, dragged around his fallen fortress, then exposed on the docks for flaying alive. The skin was stuffed with straw and sailed back to Istanbul as a war trophy for the Sultan Selim II. One can see here, of course, the narrative of East vs. West in a war for civilization itself, although one should observe that the overthrow of Catholic hegemony on Cyprus restored the privileges of the Orthodox church. But the fall of Cyprus was itself the backstory for one of the pivotal naval battles of the age two months later, the Battle of Lepanto, at which a league of Mediterranean powers including Venice decisively checked Ottoman influence at sea, pre-empting a likely invasion of Italy. Bragadin, for his part, became a potent symbol blending civic and religious martyrdom in what turns out to be (post-Lepanto) a victorious cause. One might say that he fulfilled a need. Cultures which have drawn nourishment from their legendary martyrs feel a need to prolong the spectacle of their suffering. They hark back to the desire to keep the dying man with them; and the memory of this desire strengthens their tales of holy victimhood, dramatizes them, keeps them alive. Bragadin’s torture was long-drawn-out, and it must be constantly remembered as such. … Christians’ preoccupation with relics has been complex, enduring and, at times, feverishly obsessive. It has reached high points in moments when Catholic doctrines and practices have felt most dramatically threatened. During Marcantonio Bragadin’s lifetime, and during the period immediately following, Christendom trembled before the encroaching Muslims. In this context, the story of Bragadin’s martyrdom acquired particular potency: not because the Church proclaimed him a saint, but because by analogy, he seemed to bring the ancient Christian matrydoms up to the present. He seemed to make those sufferings real and explicit, lifting them out of their legendary fogginess. Step-by-step, piece-by-piece, he “demonstrates” the martyr’s ordeal, almost as in a manual of suffering. Nor was the fulfillment merely conceptual. According to this page on Rome tourist destinations, the painting of St. Bartholomew’s flaying executed for the ancient basilica of Santi Nereo e Achilleo in the 1600 Jubilee alludes directly to the more contemporary event — notice the dark, turban-clad figure on the left. In 1596, one of the few survivors of Cyprus nicked Bragadin’s hide from Istanbul and returned it to Venice, where it remains today entombed as a relic at the Basilica di San Zanipolo.